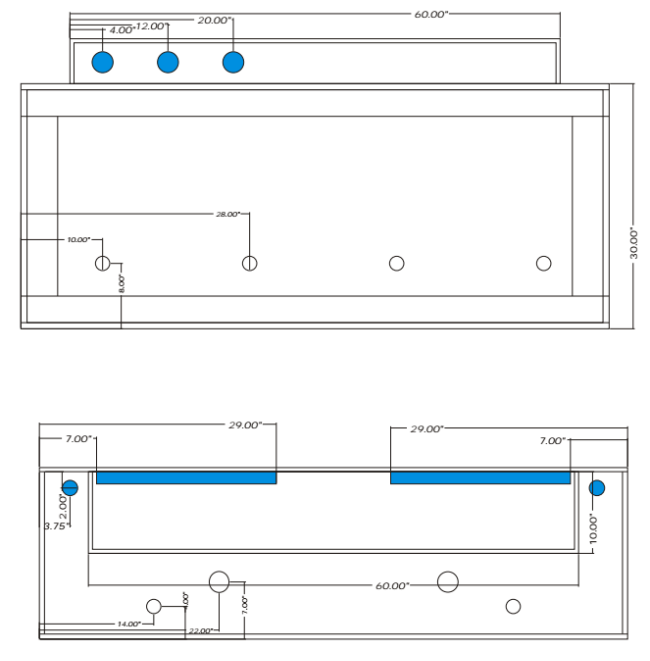 I am building a new 220 gallon display system, but can't seem to find recent answers on whether closed loop is still a solid choice for circulation. My current tank plan looks like the attached image. 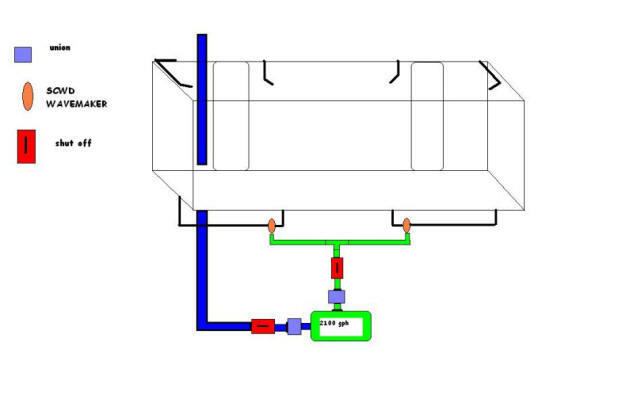 The closed loop(s) would run from the two drains low on the back wall of the tank to the four return holes at the front of the tank and the two return holes low in the back of the tank. I am considering driving the closed loop with either one or two Vectra L1 DC controllable pumps from EcoTech. Two L1 DC pumps on reef crest random mode should produce about 1800 GPH each on average with peaks at about 3000 GPH each. This I believe will be plenty of turbulent flow for my reef, while a single pump might be sub-par as well as less turbulent. The return pump will be supplying the to returns at the top of the tank but its flow will be much lower (and constant) so I am ignoring it for circulation purposes. The question is: based on what I've read here and elsewhere, it seems like many aquarists are favouring various modern powerheads rather than closed loops. What is the consensus of opinion (if there is one) among the crew about the suitability of my design / the general suitability of closed loops for reefs in today's (2015) technology? and the linked files above. For me; they're an inferior idea, technology. and 4 returns, i have a Iwaki rated at 1900 gph , 1inch in/out. Out is plumbed to pvc manifold that has flex to the 4 returns. I also have union valves on inlet and outlet. When i try and run wide open it cavitates and produces lots of bubbles, if i back down it is fine. Question , would increasing the pipe size on the inlet to 1.5 inches help? Your site is awesome, not enough hours in the day to sit and read all the information that is available. I also think my wife is starting to feel a little neglected. oops. As for my questions, I have a 6' long 125 gallon aquarium with an additional 75 gallons in a sump and a refugium. My goal is a reef system with limited fish, mostly inverts and corals. I am particularly drawn to LPS coral and some polyps. The display tank is on main floor, and equip is in a dedicated basement room. If "dilution is the solution" for reducing pollution would my tank benefit from adding a 175 gallon poly tank in my basement. I have plenty of room. I currently have a Mag 36 pumping water from sump to DT, gravity would provide flow from DT to poly tank then sump with skimmer, then refugium and then to pump chamber in sump. I would raise the poly tank off the floor so I could drain some water from bottom to remove any settled detritus from the tank. The pump is reduced to 2200 gph because of head pressure, and reduced more due to plumbing size restrictions. I'm not sure final actual water circulation. I don't have any other pumps or power heads running, I was relying on the Mag drive. My tank is drilled and has overflows in the 2 back corners and 2 additional bulkheads installed near the top also on back wall. I believe all 4 bulkheads use 3/4 pipe fittings which are too small I know but its what I have. This creates a lot of water noise due to volume moving thought small piping. I am wondering if I would be better served by replacing the Mag 36 with something smaller like around 750-1000 gph after head pressure adjustment, returning this water to DT thought the 2 bulkheads in the middle of the back wall, then add another circulation pump attached to a closed loop system with 4 or 6 outlets. Water only escapes the DT from the top of the water column in the overflow boxes, should I be removing water from near the bottom of the tank also? If so how is this safely accomplished. I plan on using a DSB soon. Also I use 3 -175 watt MH lights, do you feel this is enough for LPS like, frog spawn, hammer coral, bubble coral and so on... I have been considering switching to 250 watt MH... thoughts? instead. I'm thinking I need to do something different with lighting because my frogspawn is not opening big for a while now and also my zoo's haven't been opening either. I tested and have 0 ammonia, 0 nitrites, 10 nitrates, (down from 20 forever.. finally progress) 8.3 pH, 425 calcium, don't have alkalinity or phosphate test. Thinking its water flow or lighting. I sincerely appreciate what the staff at WWM does, living in western Iowa there isn't much for LFS here. Plus never get same answer twice. Thanks again for giving of your time and opinions. I'm Darrel - I usually answer reptile questions and although I have a Marine tank, I usually leave the aquaculture questions to the real Pros like Bob, James, Neale, etc. When I do chime in, it's on the engineering level at which I am very well qualified. The reason your letter caught my eye is because I, too, like doing things in a large scale and rely heavily on the engineering aspect to solve the technical problems -- so for that reason only, I want to chime in on one, tiny concern I have ... just food for your consideration -- AND NOTHING MORE -- then leave the real answers to the real pros. Yes, Dilution is a great solution or at least a really great asset in our systems. With enough back-tank storage, you can make a 125 gallon tank carry the bio-load of a 350 or 400 -- we just think of it as a 400 gallon tank with all the fish residing in the same 125 gallon portion of that much larger amount of water. It's a cool and elegant solution. Until the power or the pump fails -- and suddenly the 350 gallons of bio-mass are now stranded in the 125 gallon portion of the tank where the toxicity now increases exponentially. Since the bacteria of the nitrogen cycle grow on virtually ever wet surface in your system -- and they grow to the limit of their food source. What I'm saying is that in the proposal you mention below (125 gal tank and then 75 + an additional 175 in the basement) maybe as much as 2/3 of your nitrifying bacteria are now cut off from the system in which the bio-mass resides. not enough hours in the day to sit and read all the information that is available. I also think my wife is starting to feel a little neglected. Oops. As for my questions, I have a 6' long 125 gallon aquarium with an additional 75 gallons in a sump and a refugium. My goal is a reef system with limited fish, mostly inverts and corals. I am particularly drawn to LPS coral and some polyps. The display tank is on main floor, and equip is in a dedicated basement room. If "dilution is the solution" for reducing pollution would my tank benefit from adding a 175 gallon poly tank in my basement? I have plenty of room. 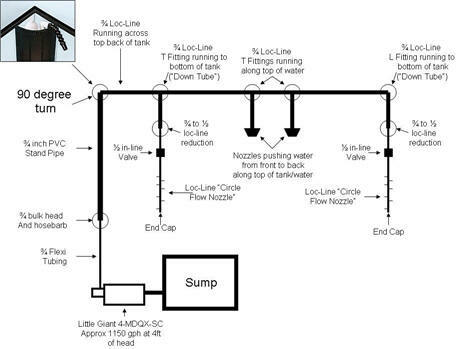 gravity would provide flow from DT to poly tank then sump with skimmer, then refugium and then to pump chamber in sump. I would raise the poly tank off the floor so I could drain some water from bottom to remove any settled detritus from the tank. The pump is reduced to 2200 gph because of head pressure, and reduced more due to plumbing size restrictions. I'm not sure final actual water circulation. I don't have any other pumps or power heads running, I was relying on the Mag drive. My tank is drilled and has overflows in the 2 back corners and 2 additional bulkheads installed near the top also on back wall. I believe all 4 bulkheads use 3/4 pipe fittings which are too small I know but it’s what I have. This creates a lot of water noise due to volume moving thought small piping. returning this water to DT thought the 2 bulkheads in the middle of the back wall, then add another circulation pump attached to a closed loop system with 4 or 6 outlets. should I be removing water from near the bottom of the tank also? If so, how is this safely accomplished? I have been considering switching to 250 watt MH... thoughts? or maybe consider LED instead. I'm thinking I need to do something different with lighting because my frogspawn is not opening big for a while now and also my zoo's haven't been opening either. I tested and have 0 ammonia, 0 nitrites, 10 nitrates, (down from 20 forever… finally progress) 8.3 pH, 425 calcium, don't have alkalinity or phosphate test. Thinking it’s water flow or lighting. I sincerely appreciate what the staff at WWM does; living in Western Iowa there isn't much for LFS here. Plus never get same answer twice. Thanks again for giving of your time and opinions. 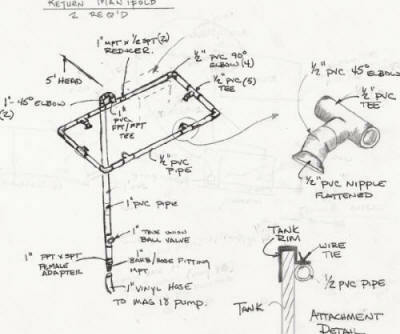 In your opinion then would I be better served using a pump and closed loop with multiple openings or just use a couple propeller pumps in the DT. In 125 g tank what volume of water should I be looking at moving. surface of tank is already there) or should I just go with some internal pumps. Would the closed loop interfere with the Wavebox? I've already got a Reeflo Snapper as my return pump from the 80g sump below. Thanks. <See here: http://wetwebmedia.com/marsetupindex2.htm the third tray: Circulation. "<Not really, but this tech. is really "old school"... not efficient, plagued w/ real and potential troubles. I would NOT use a closed loop system on any marine set up nowayears>"
Bob, I totally agree with you 100%. There is no upside, all those bulkhead fittings scare the hell out of me, definitely not worth the expense, trouble, and worry. I have just bought home a used 48" diameter, 48" tall, 3/4" cylindrical acrylic tank with 8" square center overflow that's in need of some love. It has a large decorative coral center that looks to be epoxy or resin in "aged" condition. See pictures below. with a 15 Amp Framing saw and a clamped angle iron guide- and then have a new 1.25" Acrylic spar machined and beveled to overlap the outer rip and 1" solid acrylic pins to keep it in place. I dont know yet if the coral is bonded to the acrylic bottom, but I guess I'm going to find out. I also planned on using a Starret brazed diamond hole saw to cut sixteen (yes, 16) 2" holes in the bottom of the tank for a closed loop recirculator. so I want good slow moving turbulent motion with no dead spots. To re-inforce the bottom of the tank, I was trying to figure out how to sandwich solvent weld a 1/4" Acrylic sheet cut to a 48" circle. The holes would penetrate both layers and the whole thing would sit on plywood on the existing circular steel framed base. The original setup had the bulkhead nuts on the back of the ply, rather than overdrilling the ply with the nut on the back of the acrylic. Based on the badly corroded steel stand frame and ply scrape marks, I think they must have had leaks. I'd hate to have 16 leaks plus the 6 holes that are already in the tank bottom. In the event of a major earthquake, I am thinking that schedule 80 tank bulkheads aren't going to keep the tank on the stand anyway. I want to avoid an internal bottom manifold with fewer holes - unless you can find someone with 4 foot arms that can adjust/fix them later as needed. The overhung coral makes it near impossible to work on the bottom of the tank after the water is in and the tank top is 7.5 feet in the air. As I contemplate doing this, I remembered that if I write off this tank, my 3 and 4 year old kids will likely lose respect for their Father, which could lead to a substantial long term psychiatric bill in later life. And then there's the punitive wife damages that I don't care to think about after the icy stares she gave me for showing up with this tank on the back of a trailer unannounced - "hey honey, if I'd discussed this with you first, you would have said 'no', so why say anything?". For my children's sake, can you give me some advice? Thanks Bob. Having looked at Jim on YouTube, I think he's my neighbor. Not kidding, I live in Westlake Village, Thousand Oaks, CA. With regard to a ladder and a friend, I've attached a picture which I think best describes how your procedure would translate to this tank. The opening on each side is 12" wide at it's widest point one way and 24" in the other. I take back the "best describes" bit. Please mentally substitute a small malnourished boy for Houdini. together with a subfloor cavity close to the slab that the tank is going on that could house all said noisy equipment with adequate ventilation, cold & hot water, drainage, electrical supply and physical access for maintenance. In such a circumstance, I might be really tempted, at least conceptually, to drill (and reinforce if necessary) the bottom of the tank and have nothing with moving parts in the display tank. Hypothetically speaking, from an engineering perspective, how would a competent fabricator do this? Then, same question, only for a software engineer pretending to be a competent fabricator. 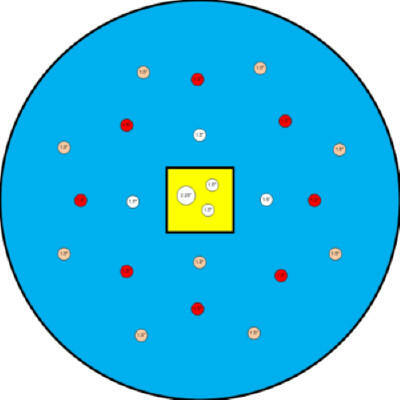 I've included a scale drawing of the tank bottom that shows the overflow box in yellow, the existing holes in white and the proposed new holes for the wavemaker pipes in red and orange. I'm OK, with heck no - just need to understand the reasoning behind what the risk/barrier is to drilling the tank ... other than "people don't do that" or "are you nuts?". I'm also OK with "Jim charges $80/hour, quit bugging me and call him to come over so he can tell me in person that I am nuts". Re: Marine Set-Up/Return Circulation Concept ... reefgeek cont. 4/8/06 Aloha WWM Crew!!!! !, <Hello John, James here today.> "Reef Geek in training" here. Great site by the way...lots of great ideas and pics!! !...thanks a lot. <You're welcome.> I have always referred to your site for great info. I have scoured your site looking for some answers to my circulation concept detailed below, unfortunately without success. I have kept a FO tank for quite a few years and now am making the "jump" into a reef. I'm taking my time and doing a lot of research (maybe too much)....<Can never be too much.> I learned that lesson from keeping my marine tank. I was hoping you might be able to give me your opinion on a return system I've planned and diagramed out. I have a 75 gallon tank 48 x 18 x 20. I know circulation needs to be a lot stronger than I'm accustomed to, along with a lot of other things. I am trying to ensure there are to be no "Dead Spots" with regards to circulation, especially behind the reef itself where it meets the glass. <A good idea.> I have an "in wall" set up for my tank giving the "window effect" so the traditional rear reef wall reef won't work for me. My aquascape is going to have 2 slopes on either side of the tank....meeting in the middle. I'm just more concerned if this will work and be worth my time, effort and $$. I know the trend is to do a separate closed loop system but I'm really trying to stay away from that concept. I'm extremely limited on cabinet space and due to the "in wall" set up and plumbing it would be a nightmare if not impossible. My thinking is I'd really hate to see the return flow from my main return pump connected to my sump just "go to waste"........so to speak......by simply pumping it back into the display tank arbitrarily. Why not take that flow and by directing to certain areas within the tank thereby putting it to good use. <Indeed!> Anyways, here's my plan. As of right now my plans are to use 2 Maxijet MP900 "Tunzean Like" mod.s located on either side of the tank pointed at each other directing flow side to side, cycling on a Chauvet timer. I know...bad idea with the timer cuz it will shorten the life of the pumps, but I really like the "waving effect" it the timer will produce with the corals so its worth prematurely replacing the pumps at a cost of 30 bucks. <MaxiJets are one of the few that work well with wave making timers. Should last quite some time.> From my return standpipe I would construct either out of pvc and/or loc-line a return system with "down tubes" placed behind each reef wall as well as nozzles directing return flow from front to back....directly opposite to the flow of the MaxiJets for a lot of turbulence. Here's my diagram.